One of my go to dishes this summer was these ricotta dumplings: http://www.thekitchn.com/thekitchn/main-dish/quick-recipe-ricotta-dumplings-with-butter-herbs-145961 I've been using cottage cheese from the local dairy rather than ricotta, and they are delicious as well as super quick and easy. I haven't done the chevre and herb topping. I top with veggies and more cottage cheese. I've done a wide array of veggies, whatever is available that week, sometimes leftovers, grilled, sauteed, roasted, etc. All have been delicious, but I think my favorite was chard and shiitakes. I'll have to try your knefles. Thank you for sharing your recipe. This is very similar to my grandmother's recipes for a hybrid pasta/dumpling she made. My grandparents were Amish. So the cooking was heavy Penn-Dutch and Amish farm cooking. I do a lot of comfort dishes with dumplings or a type of sheperd's pie with veggies. 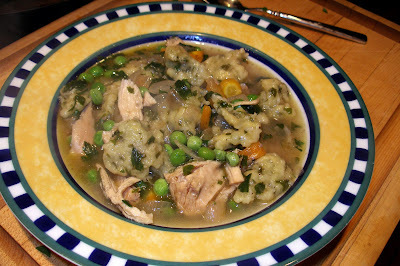 Did you pressure cook your dumplings with the chicken? Or use a crock pot. Just curious, as I am a pressure cooker fan now. Also, did you pressure your chicken and for how long? Thanks so much again for sharing. Thanks for posting this, I'll have to give it a try. We make a similar dumpling, think it came from our Mennonite ancestors. Love it! I've recently been writing on my blog with cooking older hens. I stewed mine, VERY slowly, but I was really happy with the results. I regularly make a 'scone' dough (we call them scones in Australia, but I think scones in the US are different? ), by just rubbing butter and salt into self raising flour until a crumb consistency and add milk to a soft rough dough. I also chop though herbs like parsley and rosemary for beef stews. Before serving the stew or soupy concoction I spoon blobs of the dough into the stew pot and either bake in an oven for 10 to 15 mins or cover with a lid and steam. I think this is a fairly standard recipe but its a winner none the less. Sarah, those sound delicious! My husband has fond recollections of his Lithuanian grandmother's cheese dumplings. I've bookmarked the recipe you link to and will keep it in mind anytime we have extra ricotta or cottage cheese hanging around. Thanks! Denimflyz, you're welcome. I did pressure cook the hen, but not the knefles. (See 3rd paragraph of the post for details.) Knefles were cooked in a mixture of chicken stock and white wine. Homemade Alaska, interesting to get descendants of both Amish and Mennonites in this comment section. Will check out your posts on cooking old hens. Thanks for letting me know. Phoebe, I'm not sure self-rising flour is easy to find over here, though it's possible I just don't look for it and therefore don't notice it. It seems far more commonly used in Australia than here. What you describe sounds a lot like the dumplings in the chicken and dumplings of the American south. No one here would call them scones, even though the ingredients are pretty much the same. Scones in the US are usually breakfasty-brunchy things, often sweet or at least with some fruit in them. We took the British concept and sweetened it, basically, in typical American fashion. I just found your blog because it was mentioned in a comment from a blog of a friend of mine. My husband and I are small scale, sustainable farmers in Kentucky and we are always looking for good recipes for what to do with our old laying hens. I am also German by heritage and I can't wait to try this recipe. I was wondering if it would be alright if I re-post your blog entry on our website riversongfarm.com If so, email me.